Remember how the UFC teased fans for weeks regarding a “can’t miss announcement” at last month’s “The Time is Now” press conference, but ironically wasn’t able to close the deal in time to confirm anything? 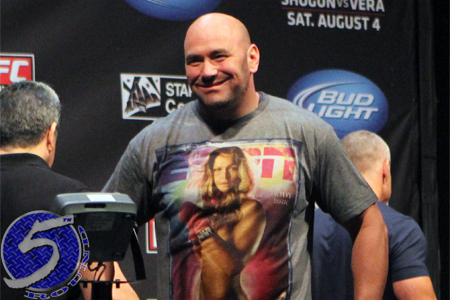 Well, it appears the big news was that the UFC was securing a uniform deal with Reebok. The UFC held a presser in New York Tuesday to report Reebok will be the exclusive outfitter and apparel provider for the planet’s premier mixed martial arts promotion. Reebok president Matt O’Toole and UFC co-owners Dana White (pictured) and Lorenzo Fertitta were on hand to make the announcement, which goes into effect July 6. The agreement is for six-years, although financial terms were not disclosed. UFC fighters will no longer be permitted to wear independent brands during a fight or leading up to their respective scraps. However, they are still allowed to land sponsorships outside of the UFC. According to Fertitta, the “vast majority of the revenue” from Reebok will go to the fighters. UFC athletes will be paid according to their ranking. Champions pocket the largest checks, and everyone else is tiered from there (1-5, 6-10, 11-15 and 16+ receive a flat salary). The sponsorship checks are the same regardless of whether the fighter performs on pay-per-view, FOX, FOX Sports 1 or UFC Fight Pass. Furthermore, fighters will receive a 20 percent cut on the back end for anything Reebok sells that contains their likeness. It was rumored the UFC was close to signing a uniform deal with Under Armour in April, but for unknown reasons nothing materialized. Reebok started to penetrate the MMA market in 2014, inking UFC welterweight champion Johny Hendricks and lightweight champ Anthony Pettis to endorsement deals. In addition, middleweights Robbie Lawler and Luke Rockhold were recently signed to Adidas. Former UFC 185-pound king Anderson Silva said in October he was also hoping to land a sponsorship deal with Adidas now that his Nike contract has come to an end. Reebok and Adidas are owned by holding company Adidas AG.